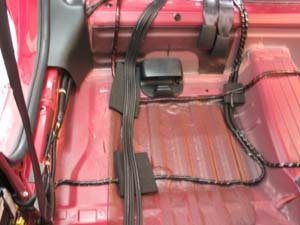 As explained earlier, the Head Unit is connected directly to the amp with 3 pairs of RCA cables. During the competition we used a 3 way Electronic Crossover in between the two. Monster Cable was used for the RCA as well as the Speaker wires. RS Audio also supplied their Silver Series speaker wires in the midrange component set. After the competition, Rotel RCAs were used, which was from the original set-up. In the Head Unit section we showed how the cables were wrapped in aluminium foil, wrapped with PVC tape and covered with plastic tubing. The single RCA cable from the head unit then travelled down the driver side together with the remote wire to the crossover at the rear. 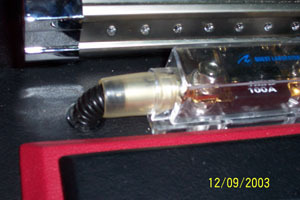 Here three pairs of RCA were connected directly to the amp behind it along with the remote wire. 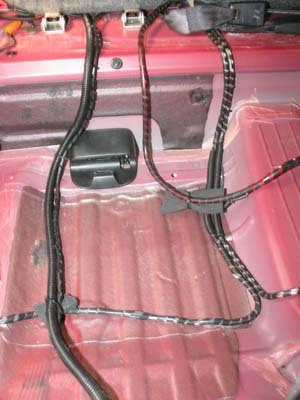 The speaker wires then travelled to the front via the middle of the car, later separating left and right to their respective door and A-pillar. The sub wire went directly across the floor to the box. Power cables travelled to the rear from the engine via a grommet and through the passenger side, later crossing the floor to go to the amp. 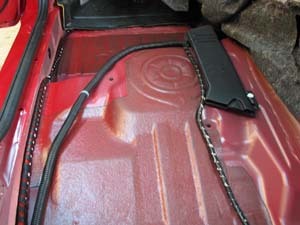 All crossing cables were isolated with non-conductive rubber insulation. All cables were also wrapped in plastic tubing and cable ties were used for anchoring. Power and Ground Cables were 4 gauge. An extra ground wire was added to the battery in front. A 100A fuse also sits alongside. We replaced the battery with a larger size one just before the final round. Additional rubber hose were used to properly insulate the power cables at their ends.